By using a homeschool unit study, you can teach your children math, literature, history, science and art using a single topic or theme. Here is some information about homeschooling unit studies and pre-packaged unit study programs. Decide what you will study. Choose a topic in the areas of mathematics, literature, science, art, history, geography or culture, or study a character trait or person. Select any subject you find interesting, from a particular children's book author to the human body to tools and equipment to dance. Decide how broad or narrow your topic will be. For instance, a study of dance could be narrowed to a study of a certain type of dance, or dances from a particular time period or country. Find books about your subject. Look for biographies, easy readers, fiction, non-fiction, fine arts, cookbooks and arts and crafts books about your topic. You may also want to look for related videos and music. In a homeschool unit study on dance, you may read biographies of dancers and choreographers, look at fine arts books about dance, study different types of music and watch videos of a performance. Make sure the subject flows naturally from the topic. You don't have to include every subject in each one of your unit studies. Your child will receive a well-rounded education as you vary your themes. A study of dance could include math by sketching a set or stage to scale, writing by keeping a notebook of vocabulary terms and writing about famous dancers, science through study of the human body, history by studying popular dances of different time periods, geography by studying types of dance in different countries, and culture by studying costumes and music. Math - Measure, build, cook, and make charts and graphs. Or choose a topic such as rocketry, architecture or business that involves mathematical computations. Language Arts - Read books about your topic. Keep a notebook of related vocabulary words. Look for related writing assignments, or compile the results of your study into a book or lapbook. Here's a picture of a homemade book from our unit study on clouds. Science - Study weather, habitats, animals, scientists, discoveries, inventions and inventors that relate to your topic. History - Study the time period, characters and historical events that relate to your topic. Make a timeline of historical events. Geography - Study maps, flags and symbols that correspond with your theme. You can also color or design your own maps and symbols. Culture - Study the food, clothing, music, art, drama and economic aspects of your topic. You can make clothing, write a play or even cook food that relates to the culture you are studying. Look for related projects and outings. When studying flight, take a trip to your local aviation museum, build model airplanes or interview a pilot. Take care not to overwhelm yourself with projects. Keep it simple and fun. Create a list of materials you will need for your study, and how much they will cost. Use supplies that are inexpensive and readily available. 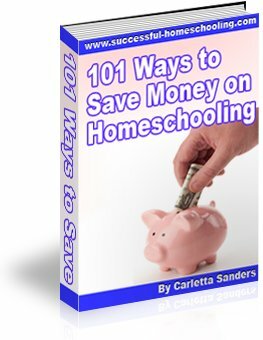 Decide how long your homeschool unit study will last. 4-6 weeks is usually a good time period. Make a rough outline of what you will cover each week, but be flexible enough to linger or move on as necessary. Here is a free, printable unit study planner that you can fill out on your computer or print and fill out by hand. For more information about using unit studies in your home school, check out my interview with homeschooler and author Valerie Bendt.